Where will you fly to next? With the power of modern air travel, it’s never been easier for people to jet off to exotic locations all around the world for vacations, business trips, and more. There are thousands of airports all over the globe, with some cities even feature multiple international airports due to their immense popularity. Chicago is one example. This city, which is the third biggest in the United States, features two major airports, so there are two airport codes to consider. The two main airports in Chicago are O'Hare International Airport, which has the airport code ORD, and Midway International Airport, which as the airport code MDW. What is the Chicago Airport Code? For Chicago, there are two major airport codes as there are two huge airports serving the area. 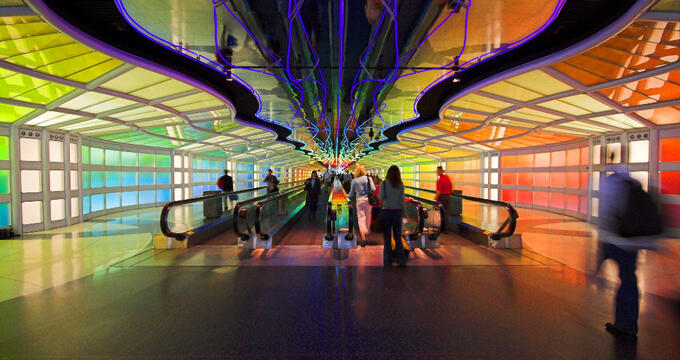 The main airport code for Chicago is ORD, which designates O'Hare International Airport. ORD is the biggest airport in the area and one of the busiest airports on the planet. The other airport for Chicago is Midway International Airport. Midway has the airport code MDW and isn’t quite as busy as ORD but is still a very popular and frequently used airport. The address for airport code ORD (O'Hare International Airport) is 10000 W O'Hare Ave, Chicago, IL 60666. A contact phone number for this airport is 800 832 6352. The address for airport code MDW (Midway International Airport) is 5700 S Cicero Ave, Chicago, IL 60638. A contact phone number for this airport is 773 838 0600. The history of Chicago airport MDW goes back almost a century. Originally known under the name Chicago Air Park, MDY was built in 1923 with just one small runway. The city took control of the airport a few years later and called it Chicago Municipal Airport, adding more hangars and runways. For a time in the 1930s, MDW was the busiest airport in the world and received a lot of funding for expansion. It lost the 'World's Busiest' title to neighboring ORD airport and lost a lot of traffic. It was renamed Midway International Airport in 1949 to honor the Battle of Midway, a WWII conflict. From the 1960s onwards, MDW has struggled to compete with ORD and went many years without a single international flight, but has started to recover in recent years. The history of Chicago airport ORD (O'Hare International Airport) dates back to the 1940s. Chicago Midway International Airport had opened several years earlier, but wasn’t large enough and didn’t have the resources to cope with modern jumbo jets. The site chosen for ORD was originally known as Orchard Field, hence the ORD airport code. It was later renamed O’Hare Field and eventually O’Hare International Airport to honor Edward ‘Butch’ O’Hare, a skilled WWII pilot. Passenger flights at ORD didn’t begin until 1955, but the airport swiftly grew into one of the busiest airports on the planet. The airport has since grown exponentially to a point where it now has four terminals and more than 190 gates. ORD is one of the top 10 busiest airports in the world, with over 70 million passengers passing through each and every year. It was the busiest airport on the planet for over three decades from 1963 through to 1998. MDW is the second major airport in the Chicagoland area and has over 20 million passengers pass through each and every year. The top domestic destinations to and from ORD are New York, NY; Los Angeles, CA; San Francisco, CA; Dallas, TX; and Denver, CO. The most popular international destinations are London, United Kingdom; Toronto, Canada; Tokyo, Japan; Frankfurt; Germany; and Cancun, Mexico. The top destinations for MDW are all domestic: Atlanta, GA; Las Vegas, NV; Denver, CO; Minneapolis, MN; and Orlando, FL. Parking at ORD is very easy. The airport has multiple lots, including no less than four different economy lots. The cheapest parking at O'Hare International Airport is found at Economy Lot G, where you can park for only $10 per day. Parking at MDW is also very simple, with various options to suit every budget and need. You can choose between lots and garages. The cheapest option for parking at MDW airport is the Economy Garage and Lot which charges just $15 per day. It couldn’t be any easier to get to and from ORD. Driving to this airport from downtown Chicago only takes a short amount of time, and there are various CTA trains, like the L and Blue Line services, connecting the airport to the city. Taxis, shuttle buses, limos, and more are also available. There are plenty of different ways to get to and from MDW airport. Driving here from Chicago is easy and doesn't take long, but there are many public transportation options too. Travelers can choose the CTA L or Orange Lines, as well as the Metra, to get to and from the airport with ease. Many shuttle buses also oerate at the airport, with taxis and rideshares also available. MDW airport does not have its own hotel but does feature a range of good quality hotels to match with all budgets and needs in the surrounding area. A lot of these hotels run shuttle buses to the airport for guests each day.